I have been reading Jean-Luc Nancy’s The Muses, which includes an essay called “On the Threshold.” This essay makes a close reading of a painting by Caravaggio called The Death of the Virgin, arguing that this painting locates the viewer on the threshold of death, the world, existence, and suggesting that art generally functions in this way, not so much representing the world as presenting it, locating us in the impossibility of the world, of existence. Given my preoccupations with the idea of the threshold (see “On the Threshold of My Death” , “On the Threshold“, “The Door, the Threshold, the Between“, and “On the Scaffold“), this essay has obvious interest for me, but there are other less obvious ways that I found myself responding to it, not all of them closely related. Rather than try to force connections between these things that do not exist. I will simply list them. 1. I cannot make myself like Jean-Luc Nancy. Though I often appreciate his work, I find something cold in him, something that I more sense than understand. In contrast to Derrida’s posture of a certain joy and a certain dance, which I respect but cannot emulate, and in even greater contrast to Heidegger’s posture of thinking thankfulness, which has become increasingly definitive for me, I find in Nancy only a posture of distance and reserve, the very posture that I dislike most in myself. 2. The painting that Nancy analyzes, The Death of the Virgin, is one of three paintings that have long been significant to me, the other two being Rembrandt’s Return of the Prodigal Son and Caravaggio’s The Conversion on the Way to Damascus. 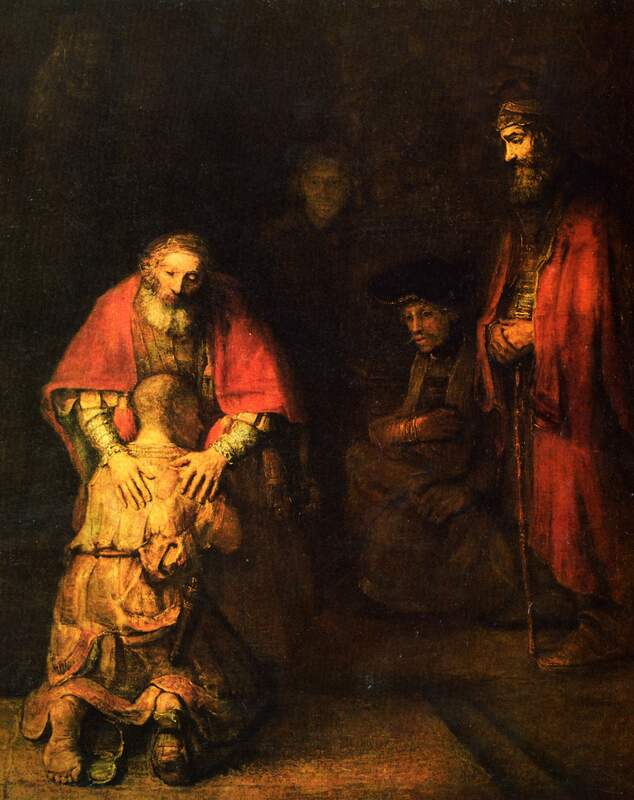 The Return of the Prodigal Son is a very famous picture, made still more famous in modern religious circles by a book of the same name by author Henri Nouwen, but I identified myself with it long before I read Nouwen, particularly with the figure of the prodigal’s elder brother on the right hand side. Nouwen’s book, though insightful in many ways, fails to account for my identification with this figure, portraying the elder son’s distance as primarily one of jealousy and self-righteousness, while it always seemed to me that his distance was the distance of reflection, of thought, of consideration. Rembrant’s elder son looks neither proud nor angry, only thoughtful, distant. He is unable to let himself be undone enough to throw himself at the feet of his father like his brother does. The figure of John in The Death of the Virgin occupies a similar position. Physically separated from the other apostles, his head resting on his hand, deep in reflection, he also is too occupied by his thoughtfulness to fully participate in the work of mourning that is going on around him. He is separated from it by his thinking of it. He is reflecting on his grief rather than being undone by it. All of this is why Caravaggio’s The Conversion on the Way to Damascus is my favourite painting, because it represents my desire, which is the complete undoing of this reflective, thoughtful, contemplative distance. Most representations of this scene depict a Saul who is kneeling or sitting in a halo of heavenly light, blind and fallen but still dignified and self-possessed. These Sauls still manage to keep their distance from what they are experiencing, but not so Caravaggio’s Saul. His Saul is lying on his back, in the dark, beneath the very hooves of his horse, his arms thrown up in fear or blindness or acceptance or sheer instinct or who knows what. This Saul is undone, and though I fear that I am too often in the posture of the prodigal’s elder brother, my desire is to be undone in the way that Caravaggio’s Saul is undone. 3. The National Gallery of Canada in Ottawa is currently holding an exhibition of Caravaggio’s work, until September 11th. Though my two favourite pictures are not in the exhibit, I would very much love to go. Unfortunately, I have neither the time or the money to make the trip. Here is a link to the list of paintings that are on display. 5. I would like to hear Nancy in dialogue with Jean-Luc Marion on the subject of the relationship between art and religion, particularly with respect to the role of seeing and visibility. I wonder whether Marion’s idea of the crossing of the visible might speak to Nancy’s concern that the religion requires of art incarnation or reincarnation, while art requires of itself only carnation. 6. I recall first seeing The Death of the Virgin in art class and being told that Caravaggio had used as a model for Mary a drowned woman who may have been a prostitute and may have been his mistress. I remember thinking, while the class discussed the sacrilegious and iconoclastic nature of this choice, how profound a truth Caravaggio had thereby managed to portray. Great resource. I do a lot of reading in classical philosophy, but I have been branching out farther into more contemporary philosophy. Thank you for the posts.